This is a peel for anyone hesitant on trying a chemical peel. Because it is mild, you will not feel a burn or stinging sensation. The peel itself has a unique combination of enzymes and acids for performing a weekly exfoliating peel. No worries about having a consultation with a skincare specialist, this peel is for all skin types. This makes it the perfect peel for pros and home users. 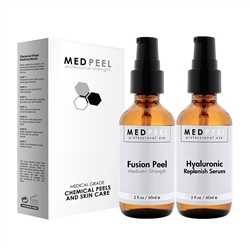 You can purchase the peel at skin-peel.com for $144.00. This is a good price based on what results you will achieve. From the manufacturer (MedPeel): The perfect choice for an at-home professional style skin care makeover. Suited for first timer skin peel users through to experienced high strength users. The Peel kit provides an awesome Level 1 Peel that can be layered to increase strength as desired. Also included is a Hyaluronic Anti Aging Moisturizer Serum great for all skin types to nourish and refresh your skin after performing the exfoliating peel. Ingredients: Deionized Water, Isopropyl Alcohol, Trichloracetic Acid, Lactic Acid, Salicylic Acid, Resorcinol, Glycolic Acid, Papaya Enzyme, Pumpkin Enzyme, Pineapple Enzyme, L-ascorbic Acid, Cellulose Gum, Phenoxyethanol, Caprylyl Glycol, Potassium Sorbate, Hexylene Glycol. Hyaluronic Anti Aging Serum : Ingredients: Deionized Water, Hyaluronic Acid, Phenoxyethanol, Caprylyl Glycol, Potassium Sorbate, Hexylene Glycol.